What a game last night!!!! New England Patriots vs. New York Giants for the championship, and this morning the state of New York is probably still partying as Eli Manning and the New York Giants defeat Tom Brady and the New England Patriots 21-17 to win Super Bowl XLVI. Super Bowl XLVI was held at the Lucas Oil Stadium in Indianapolis, Indiana. The home of Eli Manning’s big brother Peyton Manning. 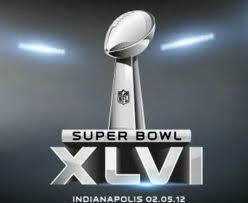 Last nights game was a rematch of Super Bowl XLII where the New York Giants defeated the New England Patriots 17-14. The festivities started off with Kelly Clarkston sing the National Anthem. Which was great, Kelly did the USA well; it was not melodramatic like it has been in previous years. Madonna came out and did her thang and she even shared the spotlights with a few cameo appearances by Nicki Minaj, M.I.A and Cee-Lo Green, just to name a few who shared the stage with her. Halftime was great, they picked a good performer. Volkswagen VW Dog and last but not least…. Did you enjoy the game? Who did you want to win? Go Giants!!! Crazy late on this one, but I was too busy celebrating!